What is it like at Rydal 120 years after the death of Wordsworth and during the poets bi-centenary year? "Cumbria" goes to find out and concludes that if Wordsworth returned to Rydal he would be familiar with almost every stone. For visually, at least, Rydal is virtually unchanged. You cannot expect anyone living within a five mile radius of Grasmere to become wildly enthusiastic about Wordsworth. unless they have made a special study of the poet and are not simply Wallowing in tradition. In their heart of hearts. Haworth folk are a little weary of the Brontés and Stratfordians wince or laugh immoderately at the mention of Shakespeare. They have suffered from over-exposure. At Rydal hardly anyone went out of their way to enthuse about Wordsworth, and yet no-one indulged in character assassination. Generally, there was resignation to the fact that he lived here in his later, more affluent days. Here he died. but his body was taken to Grasmere, and that is where most of the trippers go. Rydal is visually unchanged from the days when Wordsworth was its best-known resident. This is not from some deep-rooted idea about preserving the village as it was, in case Wordsworth was to come back again. 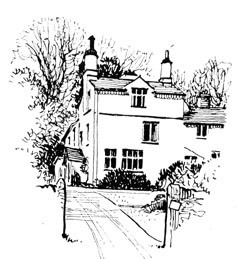 The Flemings were far more influential locally than the Wordsworths, who were their tenants for a few decades. Rydal is still very much an estate village - and no worse for that. So many places have changed radically it is a delight to sense something of the atmosphere that Wordsworth enjoyed - to make a sudden right turn from a well-used tourist route and let the years slip away in blissful remembrance of the Westmorland life that was. This is now made easier for Wordsworth devotees because Rydal Mount, his old home, is "open to view." Rydal is a village that few people really know. A motorist heading northwards from Ambleside finds himself looking at the river, if he can afford to take his eyes off the road for a few seconds. Then he notices a few buildings, and the tower of Rydal church. His attention is jerked back to the left when Rydal Water appears. One writer called it a mere raindrop of a lake, it is edged by reeds and fells soaring regally all around. Now that Rydal Mount is open for public edification and there are appropriate signs at the side of the main road, more people are making the right-hand turn near Rydal church to surmount a private road which is virtually a cul-de-sac. At the head of the village, where dry-stone walls lead the eyes irresistibly to the grey out crops and bracketed slopes of Nab Scar, an industry is still practiced much as it was in Wordsworthls day. The industry is farming. There have been no radically new ideas on how to deal with sheep in rough country. Hart Head Farm, the only one at Rydal, is run by Mr. Bruce Logan of Nook End. His shepherd at Rydal, Mr. Thomas Graves, supervises about 600 breeding sheep. Wordsworth saw Herdwick sheep during his sojourn in and about Grasmere. Much later the Swaledale breed swept in from the east, diluting and then dominating the Herdwick blood. At Rydal, a reverse process is being operated. For a year or two Swaledales are being crossed with Herdwicks "to get rather more bone into them," for Swaledales have tended to be bred a little too fine for these Cumbrian fells. Harts Head sheep run up towards Stone Arthur and Great Rigg and gathering them is a job for three men - Mr. Logan, Mr. Graves and Anthony Chapman, the Coniston huntsman, who is engaged in farming each summer. Most visitors to Rydal stop short of the fells, but walkers abound in summer, and inevitably a minority of them leave open gates which vitally should be shut. Up on Nab Scar part of a B.B.C. television film about Wordsworth was shot and the man who impersonated Wordsworth was jumping about like deer. recalled a bemused resident. Foxes spend the warm days sleeping on blaeberry-covered ledges; ravens bark hoarsely and at dusk there are badgers on the move from deep woodland setts. If Rydal is unspoiled, so is the valley beyond - a valley which penetrates the fells and ls dominated by a magnificent horseshoe formation including Nab Scar, Heron Pike, Rydal Fell, Fairfield, Dove Pike and Low Pike. Crow Wood, just above Rydal Hall, is more or less back to it's condition in Wordsworth's time. The beeches he must have seen grow to maturity were felled a few years ago and the area replanted. Rydal, with its population of about 50, has no shop, no post office, no really new buildings and a strong desire to stay as it is. 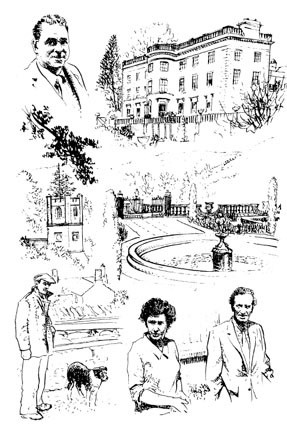 There is a lively Women's Institute of about 50 members, some of them drawn from Grasmere and Ambleside. They meet in a building near Pelter Bridge which was converted into a clubroom by a former Squire of Rydal and has an uncertain future because there is a possibility of the road being widened. This "reading room" is at the side of the highway. For years visitors to Rydal have had to be content to admire Rydal Mount from outside the garden, but a fund was launched by the Wordsworth Trust to purchase it as a permanent memorial to the poet. Wordsworth lived at Rydal Mount for 37 years. At the opening ceremony in April, a red tape across the doorway was cut by the Bishop of Carlisle, the Rt. Rev. Cyril Bulley, and he then declared the house open, observing that it was opened in typical English fashion - in debt. Another £20.000 is needed. In the first 10 days, over 2,000 people paid to tour Rydal Mount and to see objects known to Wordsworth - furniture, pictures, bric-a-brac. Mrs. Mary Henderson, a great-great-granddaughter of Wordsworth, told us the house will be open for six days a week, including all day on Sunday, and that many of the exhibits were on loan from helpful people. On the day of our visit there were three members of the Wordsworth family in the house - Mrs. Henderson, Mr. Richard Wordsworth, and a great-granddaughter, Mrs. Hilda Wells. Rydal Hall, where Wordsworths landlady Lady Fleming lived in a fine style, is by far the most imposing building in the village. Now it is a conference house of the Diocese of Carlisle, and about 12,500 visitors are accommodated each year. It is not simply a church centre but is described as a Lakeland mansion for the service of the Church. being available to all. The warden for the past two years. Rev. D. Dixon, showed us the booking list for 1970 and we quickly deduced that Rydal Hall appeals to many different organisations from a multiplicity of places. Here are 50 rooms and 30 acres of lawns and parkland extending to where a summer house (near a waterfall) was a favourite refuge of Wordsworth who had permission to go to it whenever he wished. In April, a Wordsworth evening was held in the hall, when there were selected readings from Wordsworth by Phillips Reid. A room at Rydal Hall is set aside for worship, but visitors frequently use Rydal church, where Canon J. P. S. Morton, of Ambleside, is the vicar. Rydal Hall has been used by the Diocese of Carlisle since 1963, but early this year the building was purchased and the organisers are faced with an urgent repair bill of at least £l2,500. It is mainly to attend to the roof and fabric of this enormous building. apparently quiet and unchanged and yet a place visited by many - the thousands who make for Rydal Mount and Rydal Hall and those who enjoy outdoor spectacles of the type so well staged by Lake District organisations using natural ampitheatres among the fells. Modest little Dora's Field, near the church, can be crowded on sunny days, and especially days in spring. Then this tract of land that was bought by Wordsworth, given to his daughter, returned to him on her death and then handed over to the National Trust, is spangled with the blooms of daffodils and narcissi. At the side of the main road is Rydal water, with which the migrating hosts of tourists tend to judge the whole village. As they pass, with each motorist looking at the boot of the car ahead, or sneaking views of stream and lake, they are unaware of the real Rydal - of a high-placed farm where Rocks of fell sheep mill around and bleat; of a graceful house evocative of Wordsworth and a Hall which was once the squirels home but is now open to all through the facilities it provides for organised parties. An elderly resident said of Rydal: "it's a lovely hamlet, absolutely unspoilt." There are many who would wish it to remain so in an age which has destroyed many of its beauty spots and architectural treasures for the sake of expediency.